Unlike the presidential palace and the other government buildings in Quito's old quarter, the Corte Nacional sits in a upscale area of town. Although far from the backpacker nightclubs of Mariscal Sucre, the courthouse is only about a two dollar cab ride. Of course, it seemed like everything in Quito was a two dollar cab ride from everything else. Upscale hotels and western brands are thick on the ground here, and most of the pedestrians scurry from place to place in suits. Wander a few blocks from the highest court and you can have lunch at Tony Romas. We proceeded up to the yellow facade on the first floor, looked around to see if any tourist information was on offer, and asked if we could enter. Although the security guards at first turned us away, after I fumbled an explanation in Spanish they recommended that maybe we should try the court's law library, one door down on the outside. There, a kind law librarian offered to help us look up legal articles, but explained that there weren't any publicly available tours or brochures. Indeed, the only people going in and out of the Corte Nacional appeared to be lawyers and litigants. If trials were open to the general public, it wasn't immediately obvious to us. On the upside, what the courthouse lacks in public access, it makes up for in proximity to cheap and fun lunch options. Across the road, several strip malls hold fast-food operations peddling burgers, pizza, Chinese and other typical lunch fare. They're pretty fancy businesses, as well. We lunched in a burger bar whose schtick was iPod connectivity: several of the tables had speakers to which patrons could connect Apple devices. Fortunately, we missed the lunch crowd, so we weren't distracted by dueling musical numbers. 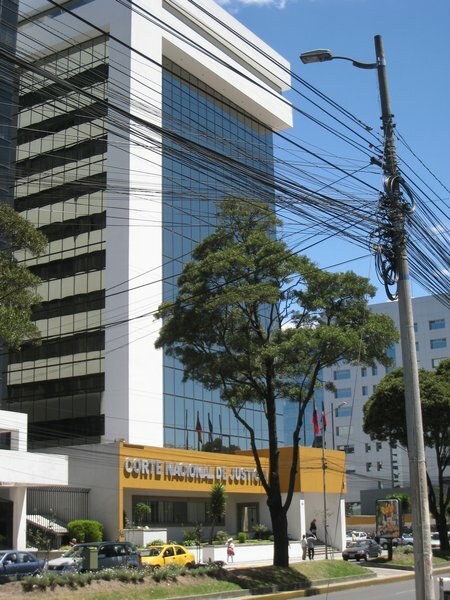 After lunch, we made our way across Quito to try our luck at the Corte Constitucional. Here we received an entirely more pleasant welcome. From the backpacking district of La Mariscal, the Court is a short walk away. First, wander down to the Avenue Patria, where artists sometimes display their wares outside the Parque El Ejido. Head south, past the Casa de la Cultura Ecuatoriana, until you get to Av. 12 de Octobre. Hang a right, and the court is a few blocks down the street, on the south side of the road. It's not a very imposing building, especially compared to the Corte Nacional. Indeed, if you didn't know what to look for, the elderly brown high rise would be look like just another office block, or perhaps one of the administrative agencies located nearby. The abstract, scales-like symbol above the door is the only bit of ornamentation hinting at a legal function. Given our earlier reception, we walked into the lobby with some trepidation. The two security guards behind glass, as well as the printed sign discouraging unannounced visitors, only increased my concerns. Nonetheless, we walked up and asked if they had any information for turistas who were abogados back in America. The guards looked a bit flummoxed, but then a short auburn-haired lady in her mid-forties sprang out of a hallway and started asking us some excited questions. Were we lawyers? Tourists? There followed some very fast Spanish, which seemed to suggest that she wanted to take us to the Public Relations office, and she waved us past the guards as if we were expected dignitaries. The lady kept a wicked pace, and I was almost out of breath two flights of stairs later, where she introduced us to a passing constitutional lawyer who spoke some English, and to whom she explained what we were doing here. He admitted that he didn't think a tourist had ever come here, and that they didn't have any pamphlets or explanatory brochures, but that the press officer might speak to us if we'd wait until her lunch break was over. The lawyer and our friendly administrator both wished us well and left us standing along in a cluttered hallway outside the public relations office. Notably, we had no passes, no credentials, nor any way to explain to any security guard who happened by what we were doing there. But after about fifteen minutes, the door opened, and a very nice officer welcomed us into her office. There followed a very interesting conversation, although I admit that I followed only about half of it. First, the public relations officer (who spoke only a little English, but was assisted by the return of the constitutional lawyer) asked if we were members of the "press." Due to an upcoming election, a press blackout was in effect, so they couldn't speak to journalists. I assured the officer that we weren't press, although we did have a blog, and she seemed satisfied. She then proceeded to give us a short history of the court's origins in 1996, some detail about its structure, and some other facts that I couldn't pick up with my minimal Spanish. She agreed that they hadn't had general tourists before, but after some thought she handed us a collection of essays on neo-constitutionalism in South America that they had lying around the office. By this time, a number of other court staff had wandered in and introduced themselves to the unusual tourists. Someone asked whether there might be a judge who was willing to see us, but no one was around, nor were there any hearings or other court activity for us to observe that day. Still, some very friendly and interested staff members went out of their way to make us feel welcome, which ensured that this one of the most successful court visits of our trip. In case they're reading, many thanks to them. Relationships between the judiciary and the elected branches have often been strained. In December 2004, President Lucio Gutierrez and his allies in Congress removed all 31 Supreme Court judges and eight of the nine judges on the Tribunal Constitucional. This rocky relationship features prominently in a recent decision by Judge Kaplan of Southern District of New York (Chevron Corp. v. Donziger), in which Chevron successfully sought to keep plaintiffs in an action in Ecuador from enforcing a judgment won in the Ecuadorian courts. (For commentary, see The Volokh Conspiracy and Opinio Juris.) The opinion contains a concise, if not entirely flattering, summary of the recent historical development of Ecuador's judicial system. Shortly after we left Ecuador, President Correa was briefly taken hostage in a hospital by protesting policemen. Several months later, the editor of one of Ecuador's major newspapers printed an editorial accusing Correa of being a dictator, prompting a libel suit by the president. Now four editors have been sentenced to prison, the paper fined $42m, and one editor has fled to the U.S.
 An interesting fact that we've mentioned before: Ecuador dollarized its economy, so greenbacks are legal currency. Indeed, it seems like most of the Sacagawea dollars in circulation are now circulating via Quito cabbies.